"Prayers won't solve anything. Only the will to fight can change the here and now! The humiliation of being caged is what triggers us to fight back. We hunters slaughter prey beyond the castle walls, consumed with surging bloodlust as our crimson bows and arrows pierce scarlet holes into the twilight." This, everyone, is the Attack on Titan review. Attack on Titan has become a rather famed anime in its short time on this world. It is based on the Attack on Titan manga, that is currently ongoing, and the anime series is famously headed by Tetsurō Araki, the director on Death Note (he also directed the Guilty Crown series that I previously reviewed in this marathon, not that you guys would notice). So, today I'll be trying to answer the burning question: is it really as great as they say? To start us off, the animation quality in this series is pretty top-notch. At first I had mixed feelings about the overall design, but it managed to grow on me. Everything is very cleanly drawn and the color saturation employed (one of my early gripes) suits the somewhat bleak atmosphere of the series rather nicely. 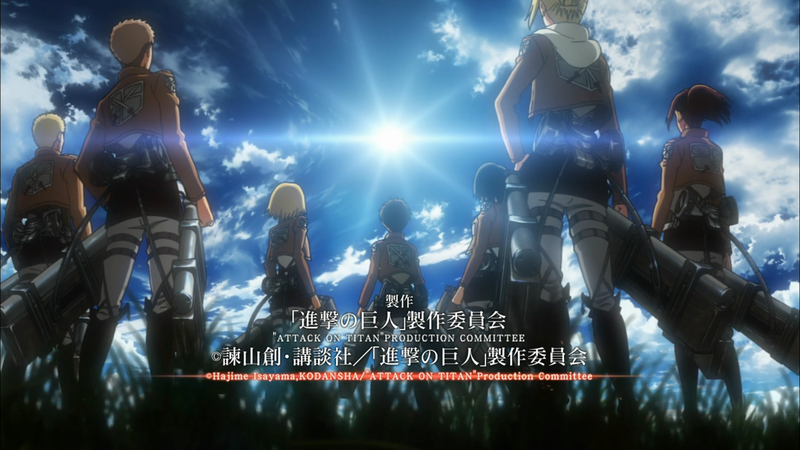 The characters, with emphasis on Eren, Mikasa, and Armin, are also in the good department. The trio go through quite a lot in just the first two episodes of the series. Eren's vow to avenge his mother and kill all the titans in existence might sound incredibly campy (and it probably looks that way on paper too) but it comes across completely seriously when it actually gets said. One might even say in a frightening manner. This is likely in no small part due to the lead up in which we actually saw his mother get killed. Mikasa, on the other hand, is widely thought of as the breakout character of both the manga and the anime. Her fiery, yet incredibly calm, devotion to protecting Eren comes across very well. Her fierce determination and presence in the series cannot be understated. Armin also gets a mention, since he goes from being a frightened, low self-esteem third wheel to a formidable ally to the trio. Although he doesn't fight well against the titans, the anime makes it clear that his brains and natural talent for connecting the dots is a significant help nearing the end of the series. The setup for this show is astoundingly great. The setting and the worldbuilding along with it are robust and pulled me right in. The series does an excellent job of establishing the world in very short order, which has been a bit of a problem with some series in this marathon. The setting of the show is within and around the walls that humanity is now confined to (in order to protect itself from titans) and it works. This setting quickly sets the table for a typical Japanese anime ripe with violence and a coming-of-age story. But... that doesn't reflect what it is at all. Instead of being optimistic or humorous, this anime is mix of tearing despair and brutality. The anime rarely hesitates when portraying on-screen violence. Some really horrible things happen on screen that only adds to the depressing reality of the show. I can just imagine what would happen if this series (even just the first two episodes) were aired in front of parental organizations here in the United States. This is definitely not a bad thing though. The gripping reality of the show serves to only further drive home the setting of the series. By not sugar-coating the scenes, they make everything so much more relatable and real. In addition to this, the series has subtext hell in it. It is arguable that many aspects of the show are explicitly meant to reflect parts of the real world, to the extent that it almost becomes a call-to-action to young adults everywhere. For example, I've seen it argued (quite well) that the actions of the Trainee Corps are supposed to be much like those of modern day young adults; we are trapped in a terrifying world of uncertainty with little hope of fighting back. Our own self-inflicted "walls" serve to only generate complacency and an unwillingness to escape our own little "world". We could generate parallels like this for hours I'd guess, but I'll just say that this sort of veiled message is a definite plus in my opinion. It makes the series not just about escapism but also about a reflection of our own broken world. I honestly think that this series is an example of Japanese sideways storytelling (whereby the writer drastically alters the trajectory of the series) gone wrong. I think that the franchise would have been a lot cooler and more original if it had attempted to take a Band of Brothers-eske stance on the plot. By this, I mean that I wish it would have focused on the 104th Trainee Corps and their trials throughout the series with added bonus that anyone can die. I don't think the stealthily inserted giant-mecha plot device is doing the show many favors beyond explaining, "Hey! This is why humans can actually win now!". Granted, the plot we have has some meat on its bones, particularly in the later stages of the show, but it isn't enough. As a result, the plot for the show is fantastic from the first episode until halfway through the Trost arc... and then it stagnates and falls. In the last few episodes the show manages to pick itself back up again, but the balance of the plot just isn't nearly as good as it was at the beginning. The conflict between the humans and the titans at the beginning is compelling. The conflict in the final episode is compelling. The conflict present between the two... isn't. Unfortunately, this category cleanly gets the supporting cast too. The anime series did a really poor job with several members of the supporting cast, to the extent where it was obvious to me who the human-titans were by the 22nd episode (although I figured out the female titan nearly from the get-go mid-season). Keep in mind that the other human-titans past the female titan aren't even revealed in the anime. Still, they made it so obvious that I felt like I was getting beaten over the head with it. The lack of clear back story and the shallow personalities gave it away. It was painful to watch. To a lesser extent, the pacing of this series is frequently brought up as both a plus and a minus incredibly frequently in discussing this series. I don't consider this a giant, glaring flaw but it is there. The pacing from episode-to-episode can feel a bit long-winded at times. I personally found it prominent during a couple episodes of the Trost arc and in the aforementioned middle-to-late series slump. Physics don't exist in this world. This is self explanatory; the most plot elements of the show are completely impossible, the chief offender being the 3-D Maneuver Gear. As such, the rule of cool is always in effect. As an example, to avoid high animation costs, they jarringly cut corners on several talking scenes with 3-D Maneuver Gear. The cables seem to be pulled taut in front of them, flying through the air. This got really, really jarring and immersion-breaking for me. They honestly should have just avoided talking with the 3-D Maneuver Gear entirely. When you think about it, talking while grappling between buildings barely even makes sense in real life. Lastly, if you do watch, realize that the anime doesn't resolve the main plot. This is because the manga still isn't finished. Attack on Titan is a brutal series that takes on quite a few tough, depressing themes and it doesn't shy away from sometimes very disturbing subject matter. Death, gore, and unsettling images are not overdone, but they happen on a regular basis. In this way, it has no qualms with showing things that American censors would die over being shown. This show is definitely not a safe one for children. I think that this series is definitely a good anime, but it hits a serious drag in the middle. This had the very real chance to be a beautiful shining stone if it didn't morph into what it did though. It lost something in the process and what it gained wasn't enough to get a net positive. That doesn't mean it's bad, I have notoriously high standards remember? It is good, but it gets a bit dragged around by the plot near the end of Trost up until the final arc. On the other hand, I think this is a great gateway anime. Watching this to get into the anime mindset is a pretty good idea actually. The plot is solid for the new viewer and it won't set your expectations too high or too low. Attack on Titan is available for streaming on Hulu, Crunchyroll, and Funimation. I'm looking at Date a Live or Evangelion 2.0 next time.